Alright guys and gals, let’s talk marshmallows. Sweet, soft, springy, fluffy pillows of deliciousness – homemade marshmallows are easy and so much better than store-bought. 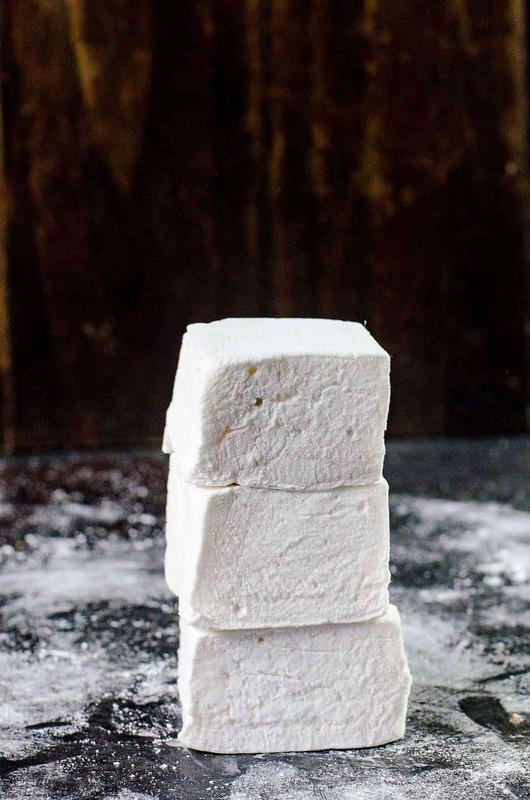 This is a long post with plenty of tips on how to make marshmallows – with or without corn syrup, and with or without a sugar thermometer. Skip ahead to the recipe if you like, but make sure to read the post for all the tips and to learn the basics of the process. When it comes to marshmallows, I’ve been spoiled. I’ve enjoyed PERFECT homemade marshmallows since I was little, because my grandmother was an absolute pro at making them. She passed on the obsession to me, and I’ve been fluffing ’em up for as long as I can remember. I’ve shared these butterscotch swirled marshmallows on the blog before, but decided it was time to make a detailed, troubleshooting post with all tips and tricks I’ve learned along the way, so that I can show you how easy it is to make the fluffiest, most divine marshmallows in the comfort of your home. So why bother making marshmallows at home? Well, as cliche as this sounds, they really are SO MUCH better than any store-bought marshmallows. Store-bought marshmallows just don’t have that pure, irresistible, marshmallow flavor or the melt-in-your-mouth fluffiness. And if you try making s’mores, you’ll find that homemade marshmallows have a really desirable melting quality that store-bought marshmallows don’t have. You can make them in any size you want and you know exactly what goes in. And if you store them in an air-tight container, it’ll keep pretty much for ever. I mean, seriously. There’s nothing in it that can go bad over time, so they’ll keep for a really long time! And if all that wasn’t enough to sway you, how about this? Homemade marshmallows are really simple to make! 🙂 True story. And even if you’re nothing like me, I have a feeling if you try it once, you just might get hooked, just like I did! So, let’s get to it. Here I’m going to show you step by step, how to make marshmallows at home. I’ll be sharing how to make homemade marshmallows WITHOUT corn syrup, as well as WITH corn syrup (and corn syrup substitutes). And then WITHOUT a sugar thermometer, and WITH a sugar thermometer. Yes, it does make your life easy if you have a sugar thermometer, but it’s not essential. After all, my grandmother slayed it without a thermometer for decades. Please note that this is a long post. This is for anyone who wants to understand the process, and even adapt the recipe to what you have at hand. If you want to skip right ahead to the recipe, please do so. But if you do have questions about the technique, please make sure to take your time and read the post. First let’s talk about the ingredients. What kind of sugar can I use to make homemade marshmallows? I always use white cane sugar and this is what I recommend. Cane sugar tastes better, but granulated white sugar (that can be derived by other means, like beet) is OK too. You can use any kind of granulated white sugar. Substitutions – There are ways to use unrefined sugar too. You can make marshmallows with unrefined raw sugar, brown sugar or you can use ALL agave syrup too. Again, you need to boil the raw sugar to the same stage as you would the white sugar. You can use maple syrup or honey too. Since these sugar substitutes have a higher water content, the process and quantities will be different. I’ll cover this in another post later on. 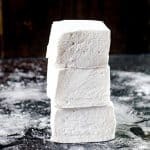 Can I make homemade marshmallows WITHOUT corn syrup? YEP! Although, it CAN be a little trickier to make marshmallows without corn syrup. The main reason why corn syrup is added is to prevent crystallization of the sugar syrup. When the sugar is melted and boiled to the point where it has 0% water, the syrup can revert back to it’s crystallized state in a hurry. All it takes is some cold water, one grain of sugar, or agitating the sugar syrup. The inverted sugar in the corn syrup helps prevent this from happening. It’s not fool-proof, but definitely helps protect the sugar syrup. If you prefer not to use corn syrup, you can leave it out OR you can add agave syrup or golden syrup (which will add some flavor) instead. This will also help prevent the syrup from crystallization. However, if you’re making homemade marshmallows only with sugar (i.e. no corn syrup or agave), you can still totally do it. BUT, you need to be extra careful to make sure that you do not re-introduce sugar crystals, or cold water. And definitely DO NOT stir the sugar syrup. I mean it. TIP FOR FIRST TIME MARSHMALLOW MAKERS – If you can find corn syrup (also called glucose syrup) or agave, USE IT. It’s less stressful knowing that your sugar syrup is less likely to crystallize. Having said that, with my method of making homemade marshmallows (vanilla marshmallows), it’s easier to not crystallize your sugar syrup which ever way you choose to make them. Can I use gelatin or agar to make vanilla marshmallows? Gelatin is the setting agent for marshmallows. If you’re vegan or vegetarian, you can use agar instead. But just be aware that the texture will change. The texture is very important for me with these homemade marshmallows and that’s why I prefer using regular gelatin. I personally haven’t used agar to make marshmallows, but I’ve done some research where I’ve read that you can substitute POWDERED AGAR for gelatin at a 1:1 ratio. One thing to note with gelatin is that it loses some of its setting properties at high temperatures. This is a problem when making marshmallows, because you’re basically adding very hot sugar (hotter than the boiling temperature of water) to gelatin here. 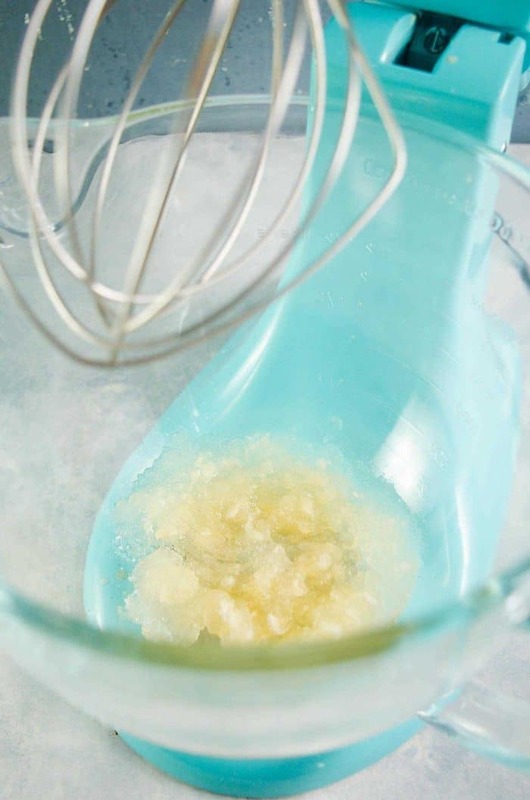 So once the sugar has heated to the right temperature, let it cool down ever so slightly (until the bubbles subside), and then add the sugar syrup along the wall of your mixer bowl, while whisking the gelatin. This cools down the sugar further, while still melting and mixing the gelatin uniformly. Agar does NOT have this problem, so you can safely add the sugar directly to the agar while whisking. But please note that the agar agar needs to be hydrated just as the gelatin was. Another shortcut is to use a packet of jello instead of unflavored gelatin. You will need to reduce about 1/4 of the sugar if you use a jello packet because this already includes sugar. Personally, I don’t like to do this for regular marshmallows, but these would be great for a layered dessert pudding. I also prefer to WEIGH the gelatin, over using the packets. This is because I have noticed that gelatin packets can vary ever so slightly in weight, between brands. What’s the purpose of adding egg whites to marshmallows? Whisked egg whites are sometimes added to marshmallows. This is especially popular among the French. The whisked egg whites make the marshmallows extra light and fluffy and a little more manageable, especially if you want to pipe shapes with the marshmallow. As soon as the sugar-gelatin mix is whisked to its full capacity, it starts to set very quickly. The addition of egg whites slows down this process a little, making it easier for you to pipe shapes, like peeps or rosettes. The addition of egg whites makes the marshmallows softer. They have less of a “bite” than egg-less marshmallows (because there’s less gelatin per egg white marshmallow vs egg-less marshmallow). They melt even more easily! I personally don’t like to add egg whites, unless I’m planning on making marshmallow shapes. It’s just an additional step and honestly, most of the time I’m just too lazy to do it. Plus, I actually prefer the taste and mouthfeel of vanilla marshmallows made without egg whites. Another reason is that marshmallows made with egg whites will not keep for as long, since you’ve got egg whites in there which can go bad fairly quickly. Whereas regular vanilla marshmallows made without egg whites will keep for a VERY long time (unless you eat it all right away, of course), and it’s safer for kids and pregnant women too. How can I add flavor to homemade marshmallows? Usually, flavoring is added at the end. The high temperature of the sugar syrup can ruin the flavoring, so it’s better to add it when the marshmallow mix has cooled down. This is especially true for extracts and alcohol-based flavors. During the whisking stage, make sure to add some salt as well. This salt will balance out the sweetness and make your marshmallows taste that much better. My go-to flavor is vanilla. I love homemade vanilla marshmallows. I ALWAYS add salt and vanilla to my marshmallows no matter what other flavors that I’m going to introduce later. Vanilla marshmallows are just a great canvas to work on. They are perfect for basic homemade marshmallows. 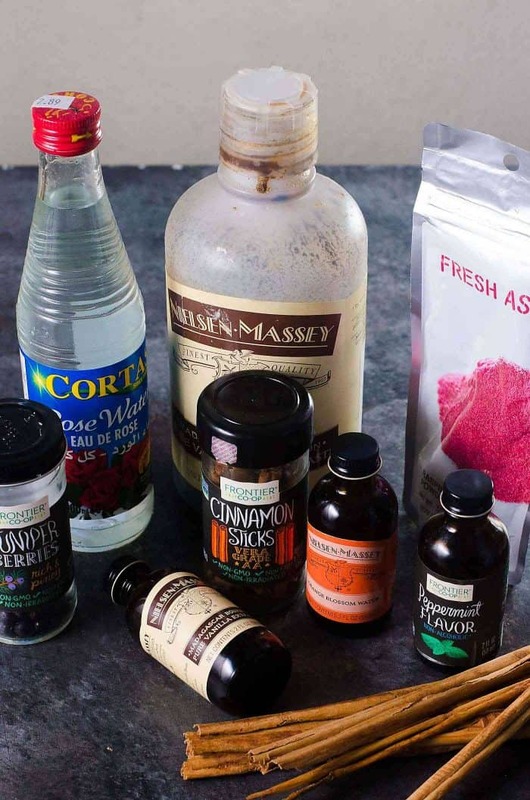 So make sure to use a good-quality vanilla extract, or my favorite – a good vanilla bean paste. I like using Madagascar bourbon vanilla, but a Tahitian or Mexican vanilla works well too. You can use other extracts like peppermint, almond, lemon, orange and alcohol-flavored extracts (rum or bourbon essence). If I’m not making them for kids, I usually like to add alcohol as well to get some artisan boozy marshmallows. For certain flavors, you can add the flavoring to the sugar syrup. Like for lemon zest (or other citrus flavors) or maple or other fruity marshmallows, you can substitute the liquid or sugar with the flavoring ingredient and proceed with the rest of this recipe. But if you do add a substantial amount of flavoring like fruit puree, or cocoa powder, you may need to add extra gelatin to make sure your marshmallow sets properly. Another way to add flavor is to substitute some of the liquid of the water used to bloom the gelatin. I’ve had some fantastic readers letting me know that they have made some creative tea flavored marshmallows, by substituting the gelatin blooming water, and some of the water in the sugar syrup too! But this recipe is on how to make homemade vanilla marshmallows, so I will show you how to make basic homemade marshmallows WITHOUT corn syrup (using agave syrup) and with real vanilla flavor. I will cover more complicated flavored marshmallows in a different post, but will add some simple flavor variations in the NOTES section of this recipe. 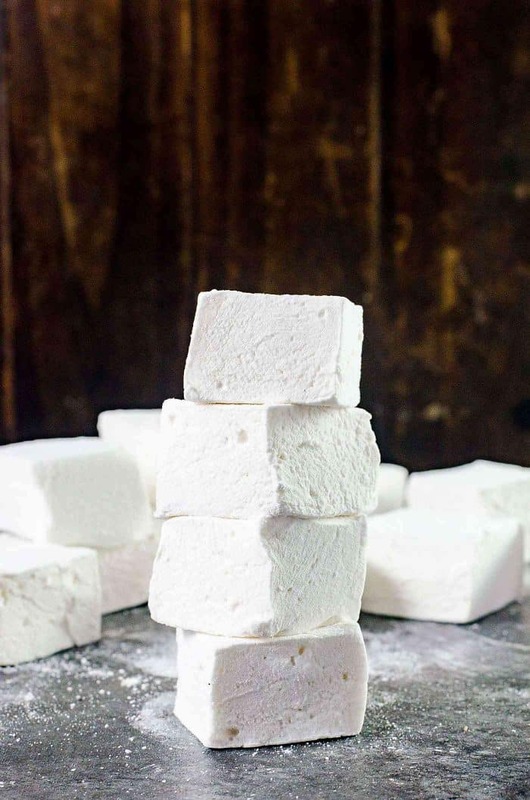 RECIPE NOTES, TIPS & TRICKS For making Homemade Marshmallows! Step 1 – making the sugar syrup. Whether you use all sugar OR sugar and a syrup, once the sugar has melted, it’s really important to make sure that the sugar on the side of the pot has dissolved completely too. You can do TWO things to make sure this has occurred. Liberally brush the sides of the pan with warm water using a CLEAN pastry brush (cold water is fine if you used corn syrup or a substitute), to dissolve the sugar into the sugar syrup. Cover the saucepan with a lid and let it “cook” for about 2 – 3 minutes. The condensation that collects on the lid will slide down the sides of the wall of the pan, washing down the sugar crystals. I usually follow method number two because it’s easier. Especially if I haven’t used corn syrup or agave in my sugar syrup. But you can use both methods if you do use corn syrup. Step 2 – making sure the sugar reaches the right temperature. This step is easy if you have a sugar thermometer. Set it to 242° – 245°F (firm-ball stage), and swirl the pan from time to time (gently) to dissipate the heat evenly. You’ll know it’s ready when the thermometer reaches the right temperature (between 242°F – 245°F). 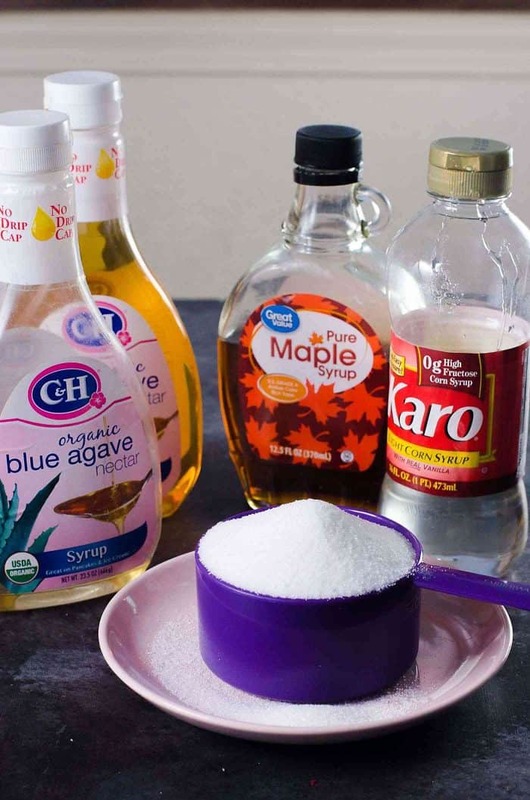 If you’re not using corn syrup (or a substitute), make sure not to agitate the sugar syrup. This means that if you are using a sugar thermometer, do not move it around in the syrup too much. This can cause the syrup to crystallize. Make sure the sugar thermometer is clipped to the side of the saucepan, with the probe immersed in the sugar syrup but without touching the bottom of the pan. If you just place the thermometer in the pot (with the probe touching the bottom of the pan), you won’t get an accurate reading. Remember to swirl the pan gently from time to time to distribute the heat evenly, and prevent hot spots! Even if you don’t have a sugar thermometer, you can still check the sugar syrup stage as follows. Every 5 minutes or so, take a small amount of the sugar syrup and drop it into a small bowl of cold water. If the sugar dissolves in the water completely – it’s not ready. If the sugar forms a cohesive shape in the cold water, but it can be completely flattened in your fingers, then it is not ready – this is the soft-ball stage. If the sugar has reached firm-ball stage, then it will form a cohesive shape in the water. You can form a firm and pliable ball with the sugar using your fingers too. It will also hold the shape it’s pressed into without dissolving. THIS IS THE RIGHT STAGE. But if the sugar forms a cohesive ball that is too firm and is not easily pliable, then it’s gone a little too far. You can still make marshmallows with this sugar syrup, but it will be slightly chewier. If you want to, you can add a little hot water to the sugar syrup and “re-cook” the syrup to reach the right temperature again. This is how my grandmother used to check the stages of the sugar syrup of the marshmallows she made. And the fact is even with a sugar thermometer, I still use this test to absolutely make sure the syrup is ready to be used. Even if your thermometer isn’t working, the sugar syrup will not lie. Step 3 – preparing the gelatin. The gelatin is mixed with cold water to let it bloom or hydrate. This stage is important because without blooming the gelatin, you may still end up with “blobs” of undissolved “raw” gelatin in the marshmallow. The blooming process ensures the gelatin will dissolve evenly and easily as you whisk in the sugar syrup. Optional step – adding egg whites. Whisk the egg whites while the gelatin-sugar mix is being whisked to make the marshmallows. Step 4 -whisking the marshmallow. I usually whisk the gelatin and sugar mix on high speed for about 6 – 10 minutes (for 1 batch), until I see the base start to pull away from the sides as thick strings. At this stage, I add the flavoring and the whisked egg whites and whisk to combine. Midway through whipping the gelatin sugar mix. The mix is still runny, but has foamed up. The marshmallows are almost ready. The base has thickened, and is light and fluffy. Step 5 – setting the marshmallow. Remember to ALWAYS rub butter, or shortening or coconut oil (solid coconut oil) on all the utensils you will be using too. This includes spatulas and knives or scissors that you will be using to cut the marshmallows. The next part is the hardest. WAITING. You have to wait at least 6 hours for the marshmallow base to “cure”. I’m not sure what the purpose of this is, but I find that marshmallows are easier to cut and have the right texture after it has set properly. DO NOT RUSH THIS PROCESS. Once you cut the marshmallows, you can toss them in the sugar mix or dip them in chocolate (yum!). Then the marshmallows are ready to be eaten. It’s important to store the marshmallows in an air-tight container, and NOT IN THE FRIDGE. I promise you these marshmallows will be the softest, fluffiest, springiest little pillows of deliciousness you’ve ever had! 🙂 Once you know the ins and outs of making marshmallows, you can do all sorts of things with it. You can add coloring and flavorings and plenty more. You can also get your kids involved with the addition of colors and flavors, and then cutting shapes out of the marshmallow. And they will most likely remember all that fun for the rest of their lives, as I can attest to. 🙂 These homemade vanilla marshmallows are the real deal. They are so much better than store-bought, and s’mores are going to be a whole lot of fun! If you like marshmallows, then you will LOVE these recipes too! Learn how to make marshmallows without corn syrup (or with corn syrup) with this step by step detailed recipe. 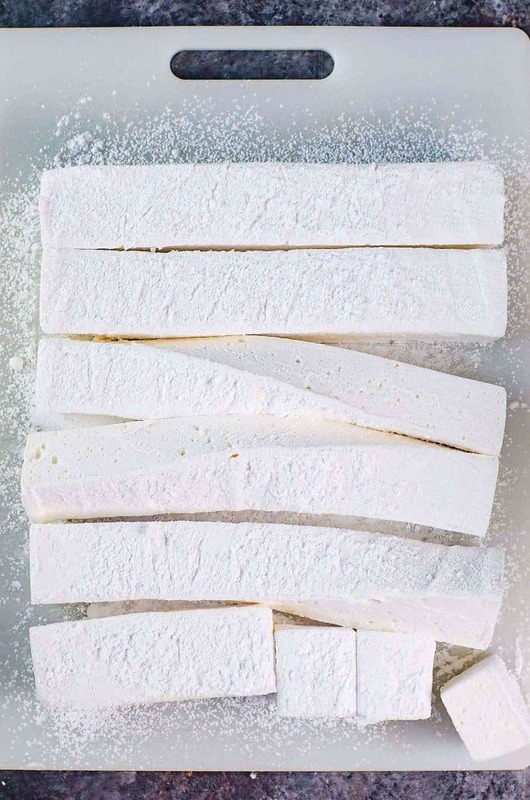 Once you know the basics, you can make perfect vanilla marshmallows every single time. Please note there is 6 hours of inactive time. Place the sugar, agave syrup (or corn syrup), and water in a pot. Stir until the sugar is moistened and mixed with the water. If you’re not using agave or corn syrup, place the sugar in the saucepan and pour the water along the edge of the saucepan. Make an “X” in the sugar using your finger - wall to wall, to let the water spread and moisten the sugar. Clip the sugar thermometer to the side of the saucepan, and set the temperature between 242 - 245°F. Let the sugar syrup cook until it reaches this temperature. If you don't have a sugar thermometer, please check the sugar stage every 5 minutes until it reaches the firm-ball stage (please read the recipe notes in the post to learn how to do this). While the marshmallow base is whisking, prepare the pan and utensils you will be using. Rub an 8 x 8 inch pan with shortening or butter (you can line this pan with parchment paper if you prefer). Brush all the utensils - spoon, spatulas with the same fat as well. Sieve confectioner’s sugar over the top of the marshmallow and allow the marshmallow to set for at least 6 hours. 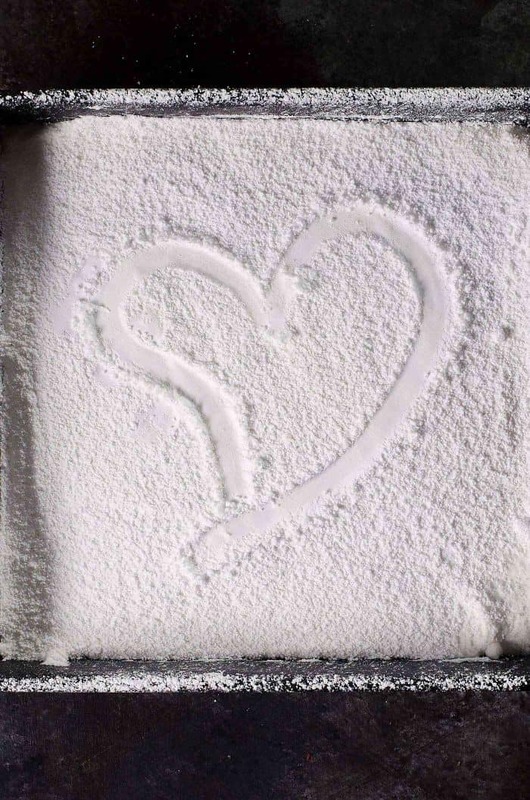 Turn the set marshmallow out onto a work surface dusted with dusting powder. Cut the marshmallows with an oiled knife or a pair of scissors. Toss the marshmallow in the dusting powder and store in an air-tight container. Note 1 - Please read the post for more detailed tips and tricks for troubleshooting. Lemon marshmallows - add lemon zest to the sugar syrup. Substitute 1/4 cup of the water used to make the sugar syrup with strained lemon juice. Then proceed as normal with the rest of the recipe. 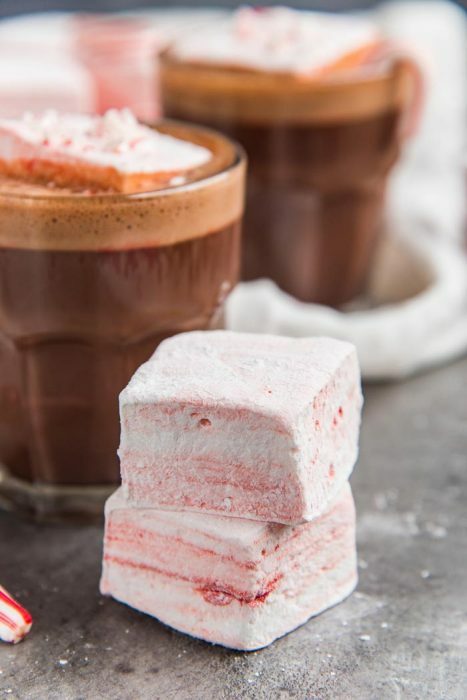 Peppermint marshmallows - you can get the recipe for these marshmallows right here! Chocolate chip mint marshmallows - add 1/2 cup of grated milk chocolate (or finely chopped chocolate) and 2 tsp of pepper mint extract to the marshmallow base and mix to combine. Unicorn marshmallows - you will need to work quickly for these. Divide the marshmallows into 3 portions. Color each portion with pink, blue, and purple. Swirl the colors together and spread them in the prepared pan. 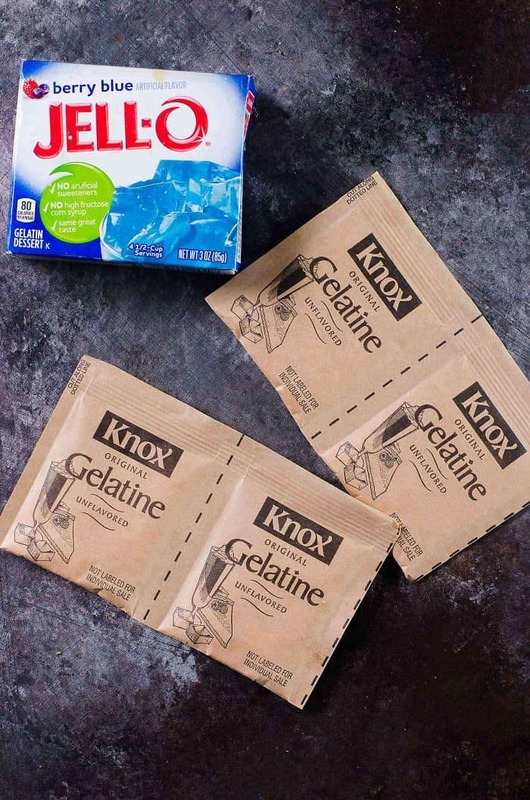 If you're using Knox gelatin, you will need 3 packets which is equal to 6 3/4 - 7 tsp (or 21.6 g ). If you're using other gelatin brands, measure out the packet content to make sure you have 6 3/4 - 7 tsp of gelatin. This is because I tried a generic brand of gelatin, and each packet contained 3 tsp of gelatin. If you're using loose gelatin powder, then you can easily measure 6 3/4 - 7 tsp of gelatin for this recipe. If you liked this recipe tutorial on how to make marshmallows (homemade vanilla marshmallows), don’t forget to subscribe for new (and free) recipes by entering your email address on the side bar (and get all these recipes delivered straight to your inbox), so you don’t miss out on a thing. You can find me on FACEBOOK, TWITTER,INSTAGRAM, PINTEREST, YOU TUBE and GOOGLE-PLUS too. This recipe and your options are amazing! I was wondering if you’ve ever made marshmallow fluff that could be used in frostings, etc. Would that just come down to whipping time? Hi! I don’t have a good scale. Can you provide the amount of sugar used in the recipe in cups? 14.5 oz is approximately 3 cups and 6 tbsp. 2 cups and 1 tbsp. Depending on how the sugar is packed in the measuring cup, the weight can vary. It’s actually approximately 2 cups and 1 tbsp of sugar. I calculated a flour measurement in my head by mistake, and just realized it. I also have a Measurement Conversion tab here on my blog with conversions for some common ingredients. Thank you so much for recipe and helpful hints! I’m hooked on making marshmallows now! I have a quick question, I made your vanilla marshmallow with passion fruit pulp, how long do marshmallows keep with real fruit? Does it have a shorter shelf life? Many thanks!! If you do add fresh fruits, the shelf life does shorten. I apply the same rule as when I add egg whites to the marshmallows, and wouldn’t keep these for longer than 1 week. Look delicious and can’t wait to try.. I’ve always made honey version but would like to try with the egg whites.. Was amazing to read your life travels I was born in Canada… Lived/ was a kid in Australia but grew up (teenage years) in New zealand and now I’m back in Canada!!!! Sugar tends to revert back to it’s crystallized form and forms crystal clumps if not cooked the right way. If any sugar on the sides of the saucepan get re-introduced to the sugar syrup after it starts to thicken, then it’ll become a clump of sugar again. It sounds like that is what happened to your sugar syrup? This happens regardless of whether you use a candy thermometer or not. 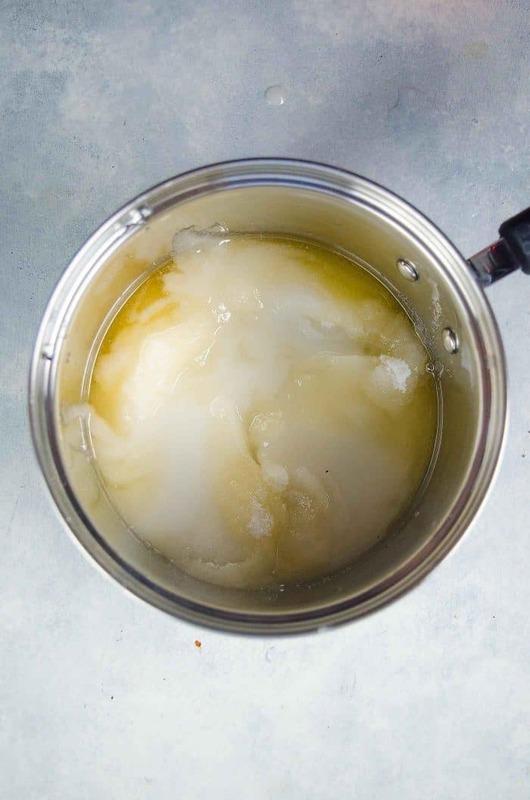 Usually, to prevent this, some brush the sides of the saucepan with a pastry brush soaked in cold water, to re-dissolve the sugar crystals back into the syrup. However, in my recipe, I have noted that you should cover the saucepan and simmer the sugar syrup for a few minutes, and this is done so that any sugar crystals on the side of the saucepan get washed back into the water by condensation. This is noted in STEP ONE in the blog post where I outline each step of the marshmallow making process in detail. Avoid agitating the sugar syrup as well (stirring, whisking etc. ), since this will also cause the sugar to crystallize. Made your recipe and we absolutely loved it. We are addicted. We are putting our marshmallows in everything. Thank you for all the detailed notes and suggestions. I did have a quick question. I have other recipes that call for marshmallow fluff. Could I use this recipe as a substitute for the fluff (assuming we don’t let it go as far as hardening)? Thanks! I’m so glad that your family loved the marshmallows! I haven’t made marshmallow fluff with this recipe, but it most likely won’t work well. The gelatin will continue to harden, and there’s a chance the sugar will weep if the marshmallow isn’t beaten properly as well. Hi! I have have some infused oil i want to try and put in my marshmallows. Will that work or will it ruin the marshmallows? I have added butter to my marshmallows which you can check out in this recipe for butterscotch marshmallows as a guide. However, please note that while a little oil can be added, they do deflate the marshmallows because emlusifying oil into the marshmallow base will remove the air and make it more dense. Hope that helps! What a great recipe for my first attempt at marshmallows! Your detailed post is so helpful. Do the marshmallows need to be covered when they’re setting? I made them in the evening and left them on the counter to set overnight. I did dust with the powder before leaving them to set, but they developed a crust on the top which I didn’t like (so I trimmed it off). I usually cover the marshmallows with a really thick layer of the powder which prevents it from forming a crust. You can cover it with plastic wrap if you like, but if any water condensation happens, it will get reintroduced into the marshmallow which can make them sticky and weepy. So make absolutely sure the marshmallow base is not warm at all. I tried doubling the recepie for the marshmellos to make a bigger batch but felt I didnt get the right consistancy even though I beat them for 30min + . What time donyou recomend beating when your making 2 recepies at once? How will the marshmllos likley turn out I “under-beat” them? I haven’t made a double batch because my 5qt stand mixer is too small to accommodate a double batch of marshmallows. 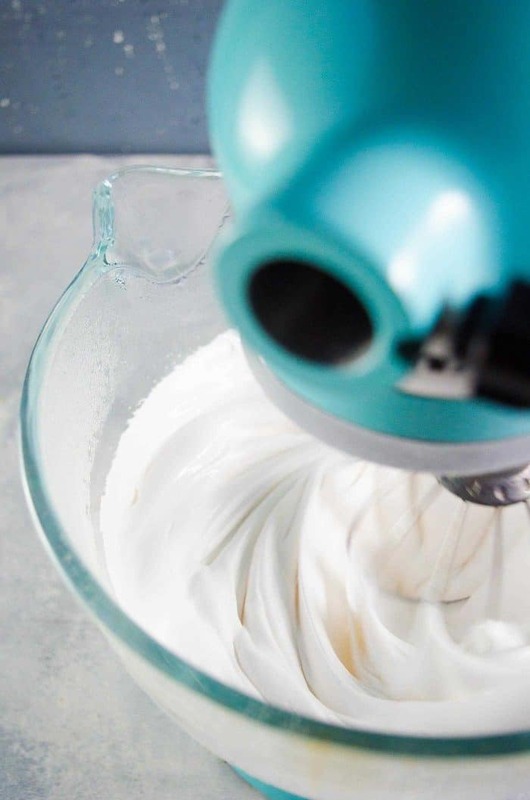 You will need to have a larger stand mixer with the right sized bowl and whisk, that will allow the marshmallow mix to expand and mix well. Usually, If I want two batches, then I make them in two separate batches because my mixer cannot handle two at once (because the size is too small). It is also very important to use a thermometer to get the sugar temperature just right, because a lower temperature may interfere with the consistency of the marshmallow. A larger amount of syrup, needs to swirled well before checking temperature and for the sugar temperature to be checked at different points of the saucepan. If you only check the temperature in one spot, and it was a hot spot, the rest of the sugar syrup might have been too cold. 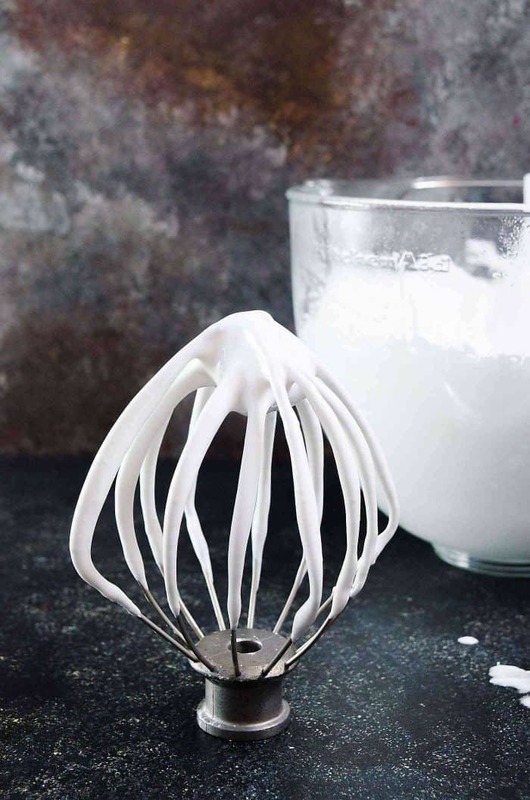 If you have the right temperature and a bigger stand mixer, then it shouldn’t take 30 minutes to get the right consistency. You only need to whisk it until the marshmallow mix is only very slightly warm. If they are under beaten, then you may end up with marshmallows that weep as they set (liquid pooling under the marshmallows). Your recipe looks delicious. I am going to try and make it soon. I will start by making it as written and then I would love to try your maple syrup version later on. I’ve read you can add 2 tsp of corn syrup to liquid honey to keep it from crystallizing over time. I wonder if this same thing would work in your recipe to keep other corn syrup substitutes from crystallizing during heating. Just a thought ;). So you wouldn’t fully eliminate the corn syrup but reduce it by a bunch. I haven’t tried adding corn syrup to my honey, but it’s definitely possible! I haven’t posted my maple syrup marshmallows yet, but I do add a little corn syrup to that too, to reduce the likelihood of crystallization. I’m hoping to try your recipe but want to use my elderberry syrup as a flavor. Would you just add similar to when the vanilla is added? I wouldn’t recommend adding elderberry syrup (elderberry cordial) at the end like with vanilla. This is because elderberry syrup has sugar in it, and isn’t as strong as vanilla extract – so you will need to add more, and it will make the marshmallows too sweet, and deflate it too. It would be better to substitute some of the sugar and water with elderberry syrup, when making the sugar syrup for marshmallows, but because I haven’t tried it myself it’s hard to know the quantities. If you have dried elderberries, you can add that to the sugar syrup as it cooks too! Thank you! 🙂 And it’s the water for the sugar syrup used right at the beginning. Lemon juice can affect the blooming of gelatin if it’s used with that. Thank you for asking, I’ve edited that recipe note to make it clearer. Thank you so much, I’m so glad you loved the marshmallows! If there’s egg whites in them, I’d recommend only keeping them for about a week at room temp., in an air-tight container. Without egg whites they’d keep for much longer. Hope that helps! Great tips, thank you! What might have gone wrong if your marshmallows didn’t ever set right? They are gooeyish? I used a thermometer and corn syrup method. Thanks! There can be a few reasons for them marshmallow to not set properly. 1 – Sometimes when you’re cooking sugar syrup, the thermometer could be set in a hot spot, and while it reaches the right temperature there, other parts of the syrup might be at a lower temperature. Swirling the pan is important to distribute the heat evenly, especially before making sure the temperature is right in the sugar syrup. A lower temperature means, that the marshmallow can be gooey. 2 – There’s a chance the marshmallows can be gooey if it wasn’t whipped enough too. Increasing the whipping time until the bowl is almost cool to the touch. 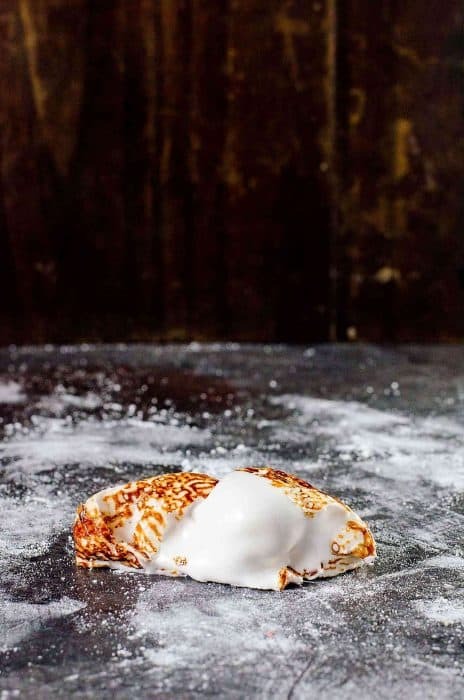 3 – If you live in a high humidity area, or your kitchen happens to be very humid, the marshmallows can absorb that moisture as it’s setting, causing it to be gooey too. If this is the case, then I would recommend cooking the sugar to 245°F – 246°F instead of 242°F, and making sure the marshmallow sets in a dry place as well (not the fridge!). Thanks for the detailed recipe and post, you obviously have a love for homemade marshmallows! 🙂 I just tried making these (my first attempt ever at marshmallows!) but my sugar syrup and gelatin mix never became white and fluffy….thus ending my attempt at making them. I don’t have a candy thermometer so tried your firm ball method. I used vegetarian gelatin that’s mostly Agar and weighed it. What do you think went wrong? Thanks! I’m not entirely sure why the mixture wouldn’t have fluffed up for you. As I have mentioned in the post, I haven’t made marshmallows with Agar powder, so I can’t be sure how they turn out. But I have had heard from other readers who use a different form of vegetarian gelatin have had no luck with making marshmallows either. The vegetarian gelatin brand that you may be using is probably not going to whip into a fluff unfortunately. 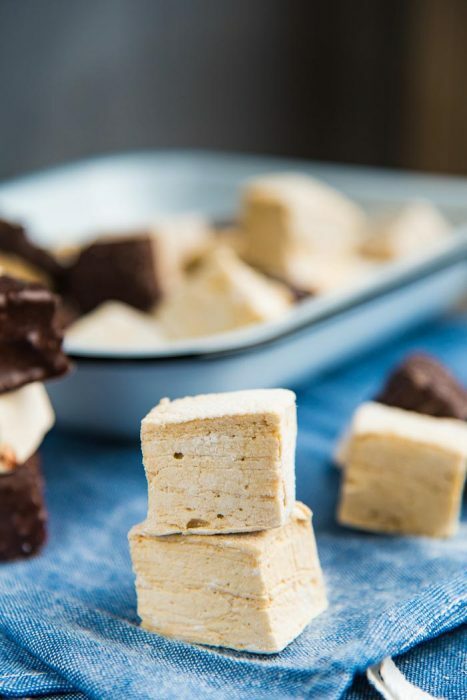 I will definitely add – Making fool proof vegan marshmallows into my list of to do recipes next year! I’ve had three attempts now, and my sugar does not seem to dissolve. I just want to throw in the whisk! Please help! Could you let me know how you’re heating up the sugar and water mix and what type of sugar you’re using too? Sugar should dissolve in water quite readily, especially when the syrup is heated. Does the sugar re crystallize? Or not dissolve at all? I tried both regular and superfine, and in bots, it doesn’t quite dissolve, then re-crystallizes. I’m using a heavy bottom saucepan, and heating it up using the closed-lid method. I trie de the open lid method too, both with and without stirring. This is really messing with my mojo, especially considering I’ve done this before without issues. Could humidity in the kitchen be a factor? Thanks so much for the speedy reply! The humidity wouldn’t affect how the sugar dissolves in the sugar, but humidity can make marshmallows softer as they set. However, to hopefully help with the sugar dissolving, you could maybe try the recipe with less sugar 375 – 400g and see how it comes out. You may need to swirl the pot a few times extra while the water is heating up with the sugar (this is the point where all the sugar dissolves for me), and then you can cover the pot with the lid to “wash down” the sides. IF the sugar is still not dissolved, I’m not sure what else could have caused it, but I would be interested in finding out! please let me know how they come out 🙂 Good luck! 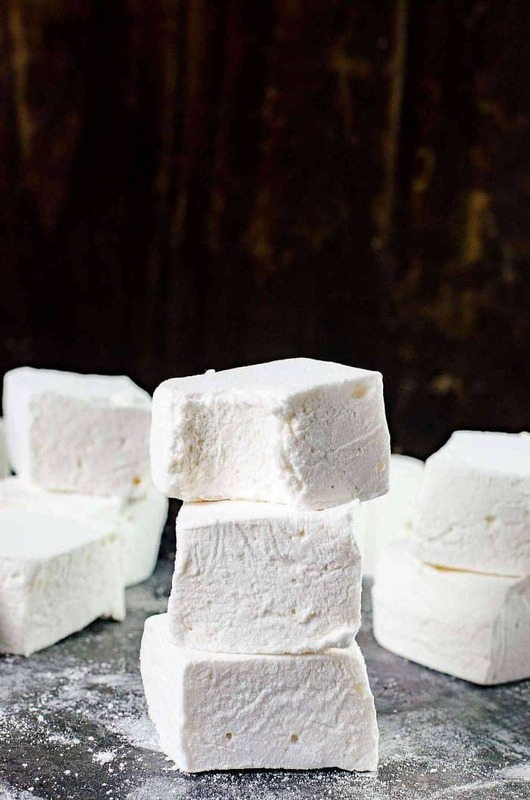 Yours is the first marshmallow recipe that I’ve read with detailed explanations of what each ingredient accomplishes and with a wide array of substitutions. Bookmarked your site and will pour over each of your posts in the coming weeks. I’m really happy to hear that Jim, thank you so much! 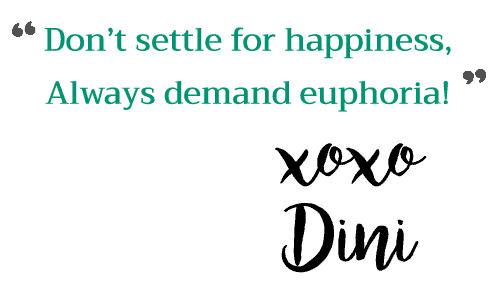 Hope you enjoy any recipes you try, and let me know if you have any questions. Thanks for posting such a detailed recipe for making marshmallows. I’ve tried other ones and have had mixed success, so the extra tips/notes were very helpful. I wanted a recipe without corn syrup, and the Agave syrup worked perfectly. Just made my second batch, and plan to gift them for the holidays! Yum! Thank you so much for letting me know Jen! I love gifting marshmallows too. I just made peppermint and butterbeer marshmallows last week and gave them out to the neighbors! 🙂 Happy holidays to you! Wanting about 1/2” square marshmallows… do you think it would be too hard to cut that small? Or any tips to using a small heart cookie cutter? Cutting them into smaller pieces would be a little more cumbersome, though not impossible. If you wanted to make them square, you would have to use a larger pan to set the marshmallows in as well. It would be too difficult to pour them into a 9 inch square pan and cut them into 1/2 inch square marshmallows. You may have to use a jelly pan roll or a half sheet pan (but I’m not sure which would be ideal). As for using a heart cutter, you can use any kind of cookie cutter, but keep some coconut oil or shortening close by, and coat the cutter with the oil to prevent the marshmallow from sticking. I made marshmallows one year as Christmas gifts…chocolate dipped, peppermint (dipped one side in crushed candy canes), and one batch flavored with honey flavored whiskey…OH MY YUM! I highly recommend trying at least one batch, you will NOT be disappointed! I’m so glad that the marshmallows came out well 🙂 Thank you for letting me know! As for the chamomile lavender flavor, that’s such a great flavor combination! Making a really strong tea is a good place to start, but I don’t think just blooming the gelatin with the tea would flavor the marshmallows well. Maybe making the syrup with the strong tea would add more flavor to the marshmallows too. I haven’t tried this technique yet (but I am planning on it for an upcoming recipe), but I think it should work! Let me know how they turn out 🙂 I hope that helps. Thanks for the tips! I ended up doing half with the gelatin and half with the sugar syrup. They turned out great! Only problem is I don’t know which one gave them more flavor. I want to try hibiscus rose marshmallow sometime as well. I made these this week and they came out amazing. They cut well, are the right texture, and taste even better. I have one problem though, After I coated all sides in cornstarch/sugar mix and put them in my airtight container they got really sticky again by the next day. Any suggestions on how to fix this? Unfortunately, I haven’t had an issue with the marshmallows getting sticky after they’ve been made. The only reason this could happen is if the marshmallows weren’t coated enough with the cornstarch/icing sugar mix, OR the marshmallows weren’t set properly (overnight setting), which can cause the marshmallows to weep and make them sticky, OR if there was moisture that somehow got into the container. If none of these was the issue, then I would recommend adding some extra cornstarch to the marshmallows in the container, to ensure they are properly coated. I hope that helps! I’ve made marshmallows multiple times before with no issues and now when i make them they get a hard crunchy layer on the outside and cracks and looks bad and isn’t a nice marshmallow texture. Do you have any idea why this might be happening? Could it be that my mixture is too hot when i pour it into the pan? Thanks!! It sounds like maybe the sugar was too hot when it was added. I would recommend cooking the sugar to a lower temperature – between 235 – 245°F. I never exceed 245 (hard ball stage), but if I wanted even softer marshmallows, I would cook the sugar only until 240 (soft ball stage). If the sugar passes the hard ball stage, it’s likely that the resulting marshmallows may form a crust. Hope that helps! Does the recipe work without the corn starch? I have no cornstarch but plenty of confectioners sugar. I couldn’t find another recipe that was as detailed, so I figured that you might know if it would work. So the purpose of dusting powder with cornstarch is to keep the marshmallows nice and dry. But yes, in theory you can make it without the cornstarch and use only confectioner’s sugar instead – use as much confectioner’s sugar as needed. But this would make the marshmallows a little too sweet for my liking, so please do keep that in mind. Hope that helps. Hello there. I’m at a high elevation and have made marshmallows before. I guess I didn’t react in time, but as I was waiting for crystals on the side of the pot to wash in to the pan, the sugar set into a solid, extremely hot clump. I an trying to wet it again and re-dissolve but was wondering if this means it was to hot? Perhaps I need to be really careful and just heat everything on low? It’s hard to tell because I have a new range as well, and it’s about twice as powerful as my old one. It sounds like the sugar was overcooked. I would recommend cooking the sugar at a lower heat, or not let the sugar cook unattended to make sure it doesn’t overcook. I personally feel that a sugar thermometer will be the best way to monitor the temperature of the sugar syrup. I hope that helps, good luck! I made these marshmallows for the first time today. Using corn syrup and loose beef gelatin. The marshmallows whipped up very quickly and as I turn them into the Container to set I noticed half a cup of the sugar syrup had congealed at the bottom. The marshmallows were still delicious. I wonder if maybe I took the suggestion to pour the sugar syrup slowly into the mixing bowl to seriously? But since I had all of that sugar syrup I just added 7 teaspoons of gelatin half a cup of water and heated the sugar syrup up in the microwave. Added 1/2 cup of corn syrup and normal amount of vanilla and salt. This recipe came out a little more spreadable I guess “wet” would be the correct description. Either way the first batch and the second batch were very good. I can’t wait to try the recipe again but this time adding the sugar syrup a little faster. These two batches I made are actually going to be making rice crispy treats tomorrow. So they don’t have to look beautiful anyways. I hope the rice crispy treats came out well! Soi see 1/2 cup water listed twice in the ingredients. Is it 1 cup water or just 1/2 cup? The first amount of water is to make the sugar syrup, and the second 1/2 cup of water is for the gelatin (step 7). I hope that helps! Thank you for the recipe, it works perfectly. – I tried yesterday to make chcoloate marshmallows by adding cocoa in the latest phase (about 3 table spons). It turned out ok, but a little less fluffy. Do you thin kit would be ok to use a little more water (20 – 30ml)? – do you thin if i use silicone moulds i should rub them with butter? I read that silicone does not stick but i have not used them yet. – if i want to use home made fruit syrup (only water, sugar and fruit juice, reduced) to enhance the fruit flavour, would you suggest to soak the gelatin in it or to boil the syrup with the water and sugar? That sounds awful. Fortunately, I haven’t experienced marshmallows that dissolved into hot cocoa, so I’m not sure why that happens. Thankfully, the marshmallows in this recipe soften and stay fluffy in hot cocoa. You can check out my hot chocolate post here for proof. Hello! Where can I find your post about the following: “You can use maple syrup or honey too. Since these sugar substitutes have a higher water content, the process and quantities will be different. Unfortunately, I haven’t published that post/updates yet. I need to do a little more recipe testing to confirm those quantities, which I’m hoping to do soon. I will share that here as soon as I get a chance. Hi Dini! Thank you for the great recipe! I recently tried a vegan marshmallow recipe which had similar ingredients and protocols but it nevet set completely. I’m wondering if I just didn’t cook the sugar long enough (as I didn’t have a candy thermomether and wasn’t aware of your ball trick). Do you think this recipe would work using vegan “gelatin” (Dried Glucose Syrup (from corn), Gelling Agents: Carrageenan, Locust Bean Gum; Stabilisers: Potassium Chloride, Calcium Acetate) and egg white replacer (Potato Starch, Tapioca Starch, Raising Agent: Calcium Carbonate. Acidity Regulator: Citric Acid. Vegetable Gum (Stabiliser): Methylcellulos)? Or perhaps forgo the egg whites and just try again using your method? I’d hate to stuff it up again. I use marshmallows to sweeten my coffee. I have tried quite a few recipes that I found online. These are by FAR the best! They’re not dense like most of the others I’ve tried. I can’t believe how fluffy they are!!! Thank you so much! In my search for the perfect marshmallow recipe I found your website and recipe. I made these marshmallows and the first day after I made them they where delicious! Now, one day later, they are a turning gritty. I store them in a container. What happend?? I hope you can help me! Thank you! This hasn’t happened to me before, so I am not sure what would have gone wrong. It sounds like maybe some of the sugar crystallized within the marshmallow. If that is the case, adding a pinch of cream of tartar to the sugar syrup and heating the sugar syrup slowly to prevent crystallization (if you’re not using corn syrup) may help. Marshmallows stay fresh at room temperature and shouldn’t go bad for a very long time if they are stored in an airtight container. If you keep them in the freezer they do harden up, and then can get really soggy as they defrost. 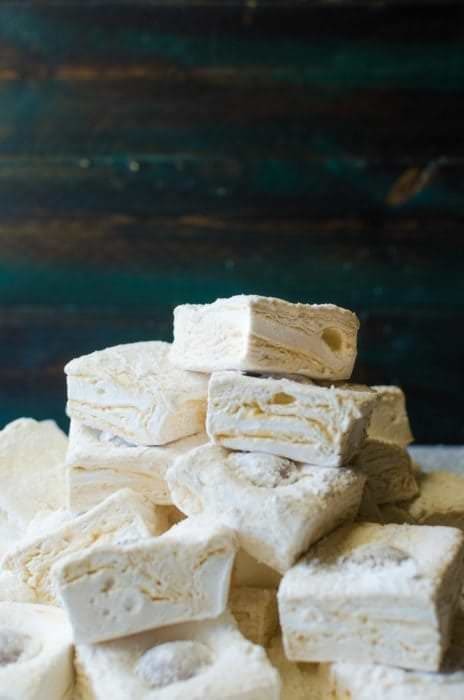 To be able to keep marshmallows for a longer time period, I would recommend making these WITHOUT egg whites, and once they are cut and dusted, store them in an air tight container at room temperature. I love this recipe. So easy have made it several times. I found freeze dried strawberries, I ground them and added them along with the vanilla. They came out great! Perfect flavor with a hint pink . Next will be peach. Looking forward to experimenting with new flavors. Love this post and how informative it is! I made this once at the cottage with packaged gelatin (3 sachets) and it turned out perfect. However, the second time I made it with loose gelatin powder according to the recipe (8 tsp), the foul smell/flavour of the gelatin stayed even after mixing. I think your math is just slightly off and it should be 7 tsp. Each sachet has 7.2 g of gelatin, so when we use 3 sachets it amounts to 21.6 g, or 7.01 tsp of gelatin (assuming 1 tsp = 3.08 g of food gelatin, found online). Weighing ingredients is really the BEST way to make sure to get consistent results! I will weigh the gelatin and update this recipe soon. Thanks again! Just want to leave a comment here to let you know that i have just made it, and i’m very happy with my first marshmallow, hoorraay! My first marshmallow is dry on top, maybe because i didn’t dust it with confectioner’s sugar as you suggest, but it’s perfectly fluffy as i imagine. What a great recipe! Our family just doesn’t do the “junk” marshmallows anymore and to buy a good quality is expensive. I did the recipe with no corn syrup, just sugar, and it turned out fabulous! All the details in your recipe were very helpful. Thanks so much for sharing! To replace the sugar with the maple syrup, I used 1 1/2 cups of maple syrup instead of the sugar and the agave syrup. Plus I only added 1/3 cup of water to the maple syrup when I’m heating the syrup too. The rest of the recipe remained the same. The 1 1/2 cups of Maple syrup + 1/3 cup of water should be heated until it reaches 240°F and you will proceed with the recipe as mentioned. I wouldn’t stir it while it’s cooking just to make sure there is no crystallization. I initially gently stirred the maple and water to just let it mix together (before cooking), and when the syrup was cooking, I only swirled the pan to mix (never used a spoon). UNLIKE STORE BROUGHT MARSHMALLOWS MY MARSHMALLOWS TURNED OUT TO BE TOO SWEET . PLEASE HELP ME WHAT CAN I DO NOW? HOW TO BE CAREFUL NEXY TIME. I just made this tonight with corn syrup and without the eggs. Going to check on it tomorrow. I used he thermometer and your grammas method by dropping the sugar in the water to test the stage. Should I cover? Thank you for sharing you recipe. Thank you. My bad. When I read the instructions, I thought I was to sprinkle the sugar only on top and then use the sugar + cornstarch after I cut the marshmallows. 🙂 I am about to cut into it so will report back. By the way, this was so easy to make and so much fun! My 4 year old helped me clean the bowl. Lol! Thanks again. Is it possible to use fruit jelly or jam in this recipe? Could you let me know what you are looking to replace, or how you were planning to use the fruit jelly or jam in the marshmallow recipe? Hi! Love this post, so much good and necessary information thank you! Do you think it’s possible for you to make the recipe in grams as well? I’m from Europe and we use grams not cups so it’s so hard to convert.. but I would love to try this recipe! I have provided grams for dry ingredients, and mL for the wet ingredients too! Some ingredients measurements are provided with teaspoons and tablespoons, as they are too light to accurately measure with kitchen scales. There is a toggle button under the ingredients for Metric measurements 🙂 Let me know if you have anymore questions! If you use jelly crystals instead of gelatine, the pectine in the crystals will only be activated by boiling (it is a different kind of gelatinization process/product). Agar is also only activated by boiling. Hope this helps any people trying to get this recipe to be vegetarian, the recipe is really fantastic and the only perfect replacement for american marshmallows i have found here in the Netherlands. 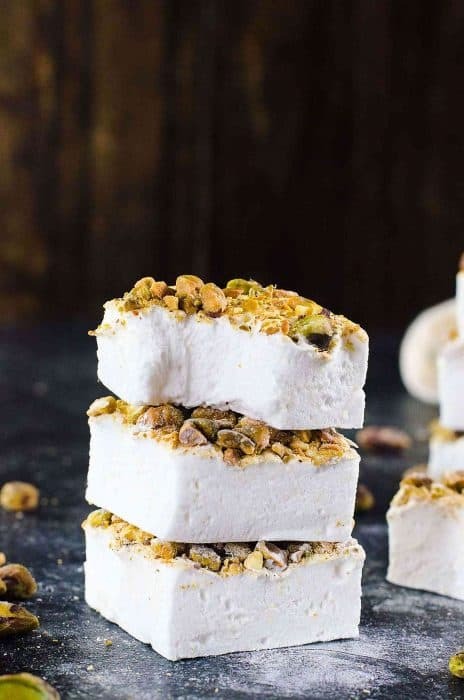 Omg, I only recently found this marshmallow recipe and I’ve already made it countless times (At least 10 if I am counting) an they’re so amazing. I’m so glad that you’ve made such a comprehensive guide ilunlike others where it just says what to do. The first batch I made, I didn’t cook the sugar wire long enough and that went very sticky and second time I overcooked the sugar and it went hard as I poured it into the gelatin. The next time I got a candy thermometer and corn syrup and it turned out so good, I just had to keep making them. I love adding pink food vlouring because it’s very hard to add too much that it isn’t pastel anymore. I prefer to dip the chocolate in melted plain chocolate (dark, milk or white chocolate) without the coconut oil. Since chocolate is firm at room temperature, I find that this was the best option. I temper the chocolate first, and then dip the marshmallow and then keep the dipped marshmallow on parchment paper until it sets. I’m planning on making some marshmallows this weekend as a gift for my friend who loves marshmallows. Just one question, should I add the food colouring with the vanilla or while the marshmallow base is whisking? Your recipe sounds amazing and I’ll give an update on if I did it correctly or not on Monday. 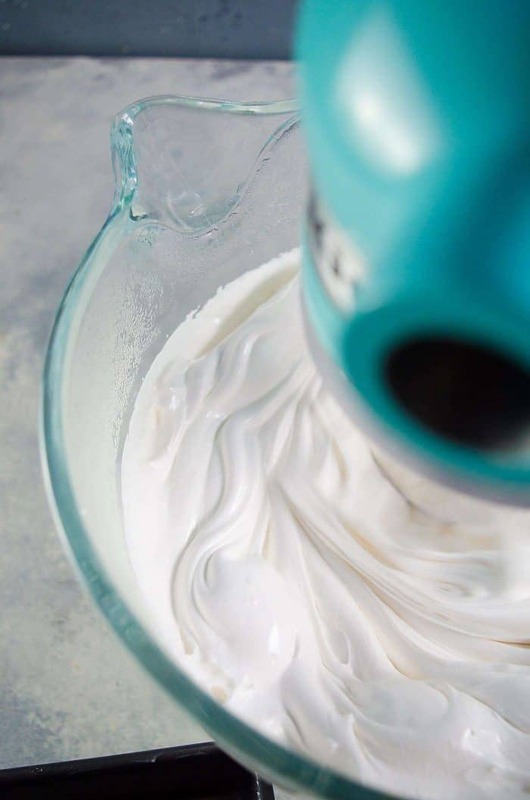 However, if you wish to have a marble effect, you can add the food coloring AFTER the vanilla has been mixed through, so that your coloring won’t mix through uniformly. I hope this helps. Can’t wait to find out how they turned out for you! The recipe was amazing and the marshmallows turned out the exact shade of pastel blue I wanted. It was awesome, and thank you so much for publishing this recipe. I did make a few mistakes that may have caused the marshmallows to be a lesser quality than how they would originally be, but the recipe was great enough that the ones I have still taste amazing. So anything that went wrong is on me. For instance, I learned I absolutely need to get a stand mixer, figure out which lids match which pots before I turn on the stove, stop stressing, and actually measure out vanilla extract instead of just being eh that’s probably enough. But once again, the marshmallows are still amazing even with the mistakes made, and I’ll definitely be using this recipe again, perhaps over and over for the rest of my life. I am so glad the marshmallows came out well! A stand mixer definitely does make making marshmallows easier for sure, but doing it without one is one fantastic achievement. Plus, a little extra vanilla is never a bad thing either 😉 Thank you so much for letting me know how they came out! How do you add liquor to the marshmallow mix? At what stage should it be added to it will not burn off? Thank you I love the recipe. You can add the liquor during the last step, along with the vanilla extract. I wouldn’t add more than 2 – 3 tbsp of the liquor so that it won’t effect the texture. Hi! I wonder if you could fix a wrong timed inserted gelatine. My stupid brain put half the gelatine after i’m done whisking the mixture and now it was in liquid form. Can i perhaps boil the mixture back to let the gelatine dissolve properly? Hi Nono, I am sorry for the late reply! I haven’t really had this happen to me before, so I’m not entirely sure how to fix it. There’s a risk that the sugar mixture won’t whisk up again if you reheat it. Boiling the mixture is a bad idea because boiling will decrease the effectiveness of the gelatin. 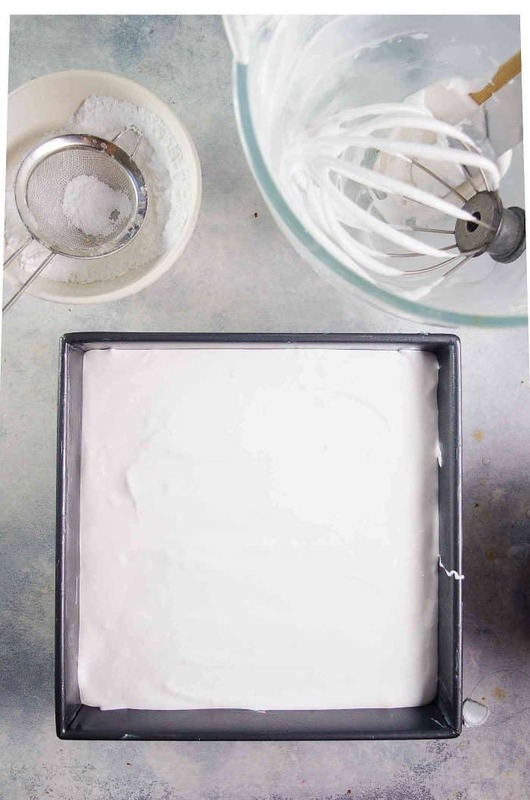 If by chance it happened to me, and I forgot to add the gelatin, I would just make marshmallow fluff with this batch by adding whisked egg whites, and just start to make another batch of marshmallows from scratch again. I hope that helps. I was wondering if marshmallows can be made with fish gelatine if so how many teaspoons would I need to use for your recipe. My marshmallow base was made exactly like your recipe calls for. It’s not fluffing up in my mixer with a whisk attachments. Help! I am sorry to hear that marshmallow isn’t fluffing up. This hasn’t happened to me before, so I may need to do some digging to figure out what could be the cause. Could you please let me know if you used my recipe exactly, or followed a recipe that’s similar to mine? To which temperature did you heat up the sugar syrup? And did you add the sugar syrup while it was still hot? Was the gelatin bloomed with some water at the bottom of the bowl too? I’m sorry for all the questions :), but it’s so that I can help you figure out what may have happened. I look forward to hearing back from you! Mine didn’t fluff up either. I used 375g sugar, no corn syrup or agave, 3/4 cup water. No temperature, but formed to a ball in cold water. Instead of plain gelatine, I used jelly crystals (thus the less sugar in step 1). Bloomed at the bottom of the bowl for around 15 mins (I timed the first 10 – but was still cooking sugar after that). Has currently been whisking on high for 10 mins – no thickening yet. Oh no! Nothing worse than liquidy marshmallows. It sounds to me like either there wasn’t enough gelatin and/or the sugar was too wet. That’s why the marshmallow didn’t fluff up in your case and they were “weeping” – which is the accumulation of liquid. I don’t usually use jello packets to make marshmallows because there’s extra sugar and flavoring in them. Once you bring the sugar up to the right temperature and then mix it with undissolved sugar (in the jello packets), it could make the mix unstable. If I was using jello packets, I’d dissolve the gelatin and sugar with the least amount of water, before I whisk it with the sugar. Can you let me know how many packets of jello you used? If you only used 1 packet, it’s likely that the marshmallows did not have enough gelatin to form a sponge matrix and set properly. I would recommend following my recipe with just gelatin and sugar and adding flavoring to it as the last step. If you do want to add some fruit puree to the marshmallow base, make sure to increase the gelatin amount by about 1 tsp to offset the extra liquid from the fruit puree. It’s hard to say for sure, without knowing which recipe and instructions you used to make the marshmallows. But usually the culprit for marshmallows that don’t set too well is either the gelatin or the sugar syrup. If you didn’t use enough gelatin, that can cause the marshmallows to melt too fast. Also, the sugar syrup needs to be at a certain temperature to get the best results. 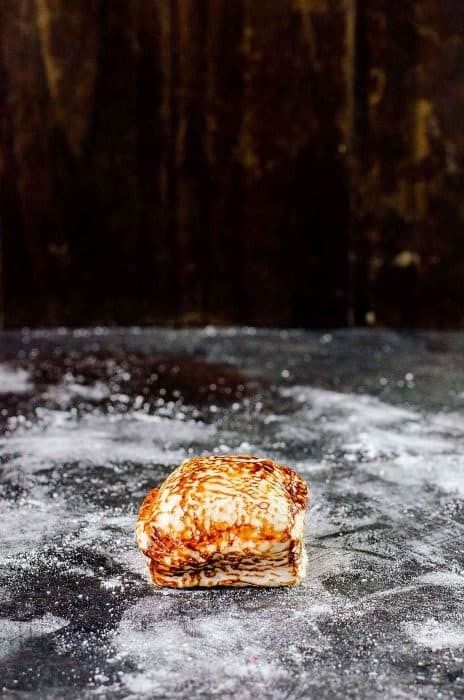 If the sugar syrup doesn’t reach that temperature, it can affect the texture of the marshmallow and make it too soft (and melt too fast) as well. I hope that helps! A packet of gelatin is about 2 1/4 tsp 🙂 I hope that helps! Wondering if you have used these to make things where u would normally use store bought marshmallows to make for example rice krispies…do they turn out ok when u melt them? These taste better and melt better than supermarket marshmallows! I would suggest keeping some extra rice krispies on hand just in case you may need to add a little extra to the marshmallows. This is because these marshmallows are softer when melted, than store bought ones 🙂 Good Luck! Can/Should this recipe be doubled? Thank you for sharing all your tips and tricks! I wanted to make marshmallows for so long but your post finally convinced me to do it. Everyone loved them! Making homemade marshmallows is so much fun! I can’t wait to try all of the variations on them! Great post! I’ve been experimenting with marshmallows lately and have had rather variable success…. it can be very frustrating. I can never seem to get them fluffy and set enough. Do you ever use sheet gelatin? And do you leave them to set at room temperature or in the fridge? You can use leaf gelatin, but it depends on what type of leaf gelatin you have access to. Each form of gelatin has a different strength, and there are three types of gelatin sheets available (silver, gold and platinum). So if you are able to let me know which type you have, I will be able to give you a rough estimate as to how many sheets you may need.